‘Hunker Down’ or Grab the Brass Ring? If you are poorly managed, have insufficient working capital, have a poor organizational structure, and believe the light at the end of the tunnel is an oncoming train, just close this screen and go back to what you were doing. But if you have a ‘well-oiled machine’, then keep on reading. I contend that more companies than you can imagine should be seeking acquisitions (or mergers) NOW rather than waiting a few more years ‘for the economy to recover’ before doing so. I don’t believe we have had an opportunity in several decades to make an acquisition at the ‘lowest cost’ as we may now. Simply put (and generally speaking), the cost of an acquisition will possibly be much higher 3 years from now than during the next 3 years (unless we have a significantly worse economy than now… in which case it might not matter!). I’d be happy to discuss the reasons in more detailed functional and financial terms with anyone who would care to learn more. But for now (because this blog is meant to be brief and more ‘discussion stimulating’ than advisory), let me say this: Those who grow now (and secure market share, staffing, economies of scale and other ‘benefits’ from acquisitions) will likely be more prepared than those who do the opposite and just ‘hunker down’. There surely is some merit to being conservative and preserving resources, but there is also a downside to that… lost opportunity. 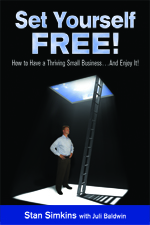 So, in light of my book about the mindset of small business owners (available by May 15 – stay tuned! ), let me suggest that you take a look at your business to see if this might just be a valid strategy for you…no matter how scary it might first seem. I can tell you that some of my clients are ‘believers’ and are acting upon it. Try this exercise: make believe you found ‘just the right company’ to acquire at the right price and on the right terms. What would that do for your company and what obstacles do you believe would exist to making it a success; i.e. what parts of your business are not totally ready to absorb such an acquisition? Even if you decide not to seek an acquisition, the answer to this question could give you some direction about where you should be working ON your business… so you will be ready should the opportunity just fall in your lap! P.S. Few acquisitions ever get done in less than 6 – 12 months from start of search…sometimes as long as 2 years! I’d love to hear your thoughts on this subject. You are currently browsing the archives for the Mergers and Acquistions category.